Probashbangla24 online Desk : European Union is providing EUR 80,000 (Tk7.84 million) humanitarian assistance for the most affected people in the collapse of the Padma River embankment in Shariatpur distirct. The affected people will get the assistance through Bangladesh Red Crescent Society (BDRCS). The BDRCS will distribute shelter tool kits including tarpaulins among those who have lost homes during the devastating erosion, said an EU statement. Besides, cash will be provided to targeted households to ensure those most in need have enough means to meet their basic needs and sustain their day-to-day livelihoods. 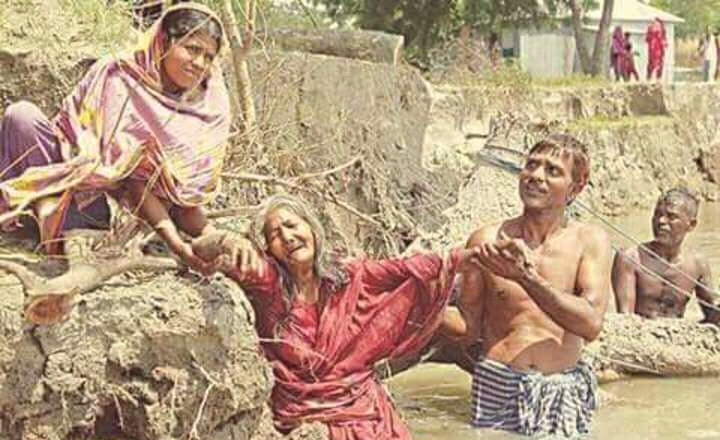 An increase in water levels in the Padna River – the largest river system in Bangladesh- that has been severely affected by erosion since early September – during the first three weeks of September led to the sudden collapse of many vulnerable portions of its embankment. More than 8,000 houses and public facilities located within a five-kilometre radius from the river have been washed away, resulting in the displacement of more than 43,000 people in the Naria and Zajira sub-districts, alongside a 1.5-kilometre stretch of main roads and infrastructures. It is estimated that over 8000 people will become permanently displaced. The event has also caused significant damage to crops, seeds and agricultural lands, impacting the overall food security of the affected populations.